Housing is typically the one leveraged investment available. You’re paying for housing whether you own or rent. Owning is usually a form of “forced savings”. Owning is a hedge against inflation. A homeowner’s net worth is over thirty times greater than that of a renter. 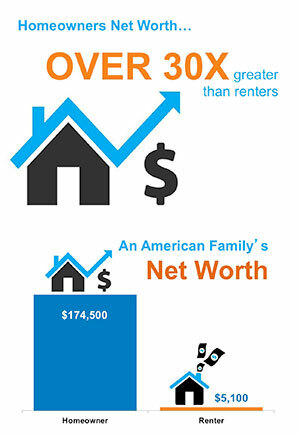 The average homeowner has a net worth of $174,500 while the average net worth of a renter is $5,100. Most experts are calling for an increase in mortgage interest rates throughout the year. The Fed has begun pulling back some of their stimulus package which has helped the housing market by keeping long term mortgage rates at historic lows for the last few years. 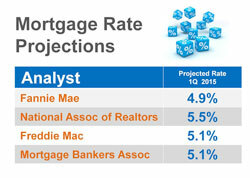 Below are the most recent projections of where rates will be at this time next year by the four major agencies. However, we believe that the government is not afraid to shoot right past these levels. Only time will tell. However, many feel that rates will be in the 5.25-5.5% range by this time next year. strategists about where prices are headed over the next five years. They then average the projections of all 100+ experts into a single number. They help with all disclosures and paperwork necessary in today’s heavily regulated environment. They act as a “buffer” in negotiations with all parties throughout the entire transaction. The Mortgage Bankers Association (MBA), the National Association of Realtors, Fannie Mae and Freddie Mac all projected that mortgage interest rates will increase by about one full percentage over the next twelve months. Many experts are calling for home prices to also increase over the next year. thousands will sell today and thousands will sell each and every day from now until the end of the year. It is totally within your power to decide whether it is the right time for you and your family to move. Even in the current market. “How?” Let’s look at the simplicity of the famous Serenity Prayer and apply it to buying a home in today’s real estate market. As an individual, there is very little you can do to impact either of those two situations. The best think-tanks in the country are struggling to discover what impact each of these items have on real estate. Whether you are a first-time buyer or a move-up buyer and you believe now is the right time for your family to purchase a home – DO IT! Prices will only be higher later this year and though interest rates are rising they are still at historic lows. That means that your monthly housing expense will still be lower than almost any time in the last 50 years – and probably lower than your current rent payment. With the winter ending, the outlook on inventory is positive. Sellers will look to come out of hibernation and list their homes. The question is whether or not it makes sense to delay moving on with your life until everything gets ‘better’. Should you not buy a house and enable your kids to attend the school you have already decided is best for them? Should you spend another winter up north even though your doctor recommends you move to a climate better suited to your current medical situation? This is where your wisdom must kick in. You already know the answers to the questions we just asked. You have the power to take back control of the situation by moving forward. The time has come for you and your family to move on and start living the life you desire. That is what truly matters.